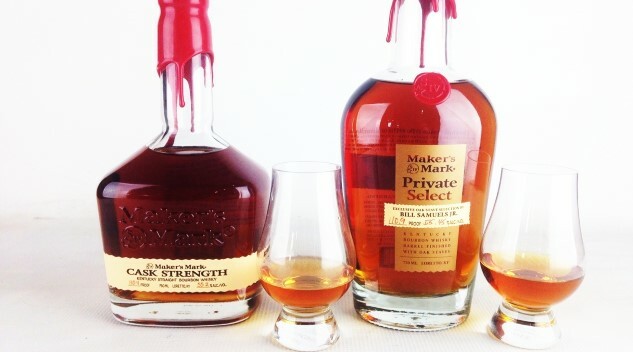 If you’ve paid a visit to the Maker’s Mark distillery in Loretto, KY in the last few years, then you’ve probably heard about the company’s “Private Select” program. The idea allows distributors, bars and retail customers to create custom versions of cask strength Maker’s Mark by taking newly matured barrels and finishing them on freshly toasted barrel staves of the customer’s choice. With a choice between five different staves (with names like “Roasted French Mocha” and “Toasted French Spice”) that can be combined in a plethora of ways, the program allows for subtle variations upon the Maker’s Mark Cask Strength formula that are functionally endless. Now, perhaps as a way of advertising the program in the only way they know how, Maker’s Mark is putting some of that Private Select bourbon on store shelves. That product is called Maker’s Mark Bill Samuels, Jr. Private Select, and is named after the former president of Maker’s Mark. Samuels is credited with the creation of the brewery’s second ever bourbon, Maker’s 46, which is the standard Maker’s Mark that is then finished on Maker’s 46 seared oak staves. Fittingly, the Bill Samuels, Jr. Private Select is likewise finished on these same types of staves—one of the five varieties that are available to consumers when they create their own Private Select batch. The distillery’s own Private Select is thus essentially the cask strength version of Maker’s 46, favoring the singularity of using only one type of stave rather than multiple ones in combination. This, they say, “amplifies the taste and long finish that Maker’s fans have come to love over the years, while further enhancing the signature flavors found in Maker’s 46 with even more vanilla, oak, caramel, and spice.” The further customization results in an SRP that is somewhat (but not inaccessibly) higher than the standard cask strength, at $79.99. Because this is a Paste review, though, we weren’t about to simply taste the Bill Samuels, Jr. Private Select on its own. Instead, we tasted both the standard Cask Strength Maker’s Mark and the Bill Samuels, Jr. and compared the two. So let’s get into it. On the nose, the standard Cask Strength Maker’s Mark implies the rich, sweet wheated bourbon it is. I get a whole lot of caramel, some vanilla and a sweet (but sort of roasty) citrus quality that reminds one of the scent of a flamed orange peel. Repeated sniffs reveal a plethora of red fruit/berry notes, along with considerable sweetness. Booze is present, but perhaps not as prominently as one would expect for an overproof bourbon in the 110 proof range. On the palate, it’s likewise rich and pretty sweet—perhaps a bit too sweet for some drinkers—with flavors of dusty rye, cream of wheat and more orange citrus. Plenty of caramel as well. This is an overproof bourbon for lovers of rich, sweeter, deeply caramelized whiskey, which drinks fairly easily considering the proof. You can drop a cube in here, but unlike a lot of cask strength bourbons it doesn’t demand water or any specific dilution, being lower than most of them in ABV. All in all, Cask Strength Maker’s Mark is solid, if not the most distinctive cask strength release you’re going to find. It certainly should appeal to fans of the regular Maker’s profile, though. I must admit I had my doubts as to how different this bottle would actually be to the liquid in the standard Cask Strength Maker’s Mark, but upon the first smell it’s clear that being finished on newly seared staves does indeed impart some easily detectable qualities. On the nose I get plenty of juicy-sweet Mandarin orange and a similar alcohol presence, but greatly amplified spiciness. The vanilla pops with more assertiveness—my notes say “vanilla candy” at one point—which seems to mute the caramel/molasses quality a bit while amplifying notes of baking spices such as cinnamon/cola. It makes for a nose that is certainly more distinctive, overall. On the palate, the Bill Samuels, Jr. Private Select is even more different from the former. The presence of the wood is considerably more pronounced, which contributes a toasty quality of cedar cigar box and a hint of campfire. There’s a lot more spice here as well—a lot of “cola/Dr. Pepper” spice melange, and lots of accompanying vanilla bean. The caramel quality, on the other hand, seems to have been toned down slightly by the increased assertiveness of the other flavors, while a more detectable sense of tannic dryness on the back end makes this seem slightly less sweet to me overall. All in all, the Private Selection variation upon the the cask strength formula strikes me as measurably more unique and complex, slightly drier, but still pretty damn rich—this is, after all, 110 proof wheated bourbon. All in all, it’s a well-rounded overproof wheater that, like the regular cask strength, retains good drinkability for an overproof whiskey. Or in other words, feel free to enjoy neat.